He’s an academic and an adventurer, an Oxford-educated expert in Sanskrit who 50 years ago traveled overland from Damascus to Baghdad, then sailed across the Arabian Sea from Bombay to Aden in an untested boat with limited charts. He’s an engineer who met his future wife while singing in a madrigal group at a theological college, a former Army medic who’d been to Kandahar half a century before most Americans had heard of the place. He’s a farmer who still writes learned articles about the subcontinent. The scion of one of Martha’s Vineyard’s oldest families, his father also was Oxford-educated and an Olympian. And he’s a historian who this weekend will guide the curious around the historic homes of Vineyard Haven. He’s James H.K. Norton, and after an hour or so of listening to him talk about his many and diverse antecedents, interests and adventures, one is prompted to observe that he comes off like Martha’s Vineyard’s answer to Indiana Jones. And that suddenly stops his flow. “I don’t know Indiana Jones,” he says. Well, there is only room in a brain for so much knowledge. Over the previous 90 minutes, he has ranged across topics as diverse as geology — the cretaceous origins of the Gay Head Cliffs — and theology — “Dogma is a negation of spirituality,” and across vast spans of geographical and historical distance. Popular culture just does not fit. Jim Norton acknowledges other deficits, too. On the day of the interview, he was working at plastering the walls of the guest house at his farm. It had not gone easily, and he joked that he might have been better at it had he worked as a plasterer during his youthful summer vacations instead of working at the Vineyard Haven Yacht Club, where he was fleet captain. But if he had done that, he might have become someone else, for it was while teaching sailing, during breaks in his engineering studies, that he got the bug for India. “The father of two of my students was a banker from New York, and he would come up weekends to be with his family. He started talking to me one day, about his Second World War experience, in the quartermaster corps in Calcutta. “It was obvious it was an experience which totally baffled him, that nothing in his career as a banker could ever explain to him what he experienced in Calcutta. So he returned to college and there connected with a couple of academics who knew something of India. One of them, a teacher at the Yale Divinity School, even volunteered to supervise a reading list for him. He finished the engineering degree, but he knew already that his future was elsewhere. There was a complication, however. He was in line to be drafted. But Mr. Norton found a way to defer; the Army was short of trained meteorologists. And so summer in England turned to fall at Oxford, beginning his studies and corresponding with the draft board. He was assigned to the medical corps, to a unit that looked after burns patients. “It was intense, but affirming. I was always grateful for the experience in many ways. At least I wasn’t shining my shoes in Germany somewhere,” he said. He was there 18 months, then applied for early release so he could make the fall term at Oxford. But his was considered a “doubtful case.” He went to his commanding officer, a colonel, to ask why. The colonel got on the phone and began working his way up through the ranks, trying to find out why Mr. Norton was being denied release to study at Oxford. He duly graduated and secured a Ford Foundation grant to continue his studies in India, traveling part of the way overland, as previously mentioned, to the University of Madras. That was in 1957. Three years later, having got his doctorate, he happened to see a newspaper story about a boat-building venture in Bombay. “The company was called the Acme Flooring Company,” he recalled. “It was an Italian company which began in the 19th century providing marble floors for maharajas. They had acquired a small shipyard. This American, on a Ford Foundation project to do a city plan for Delhi, heard about them and engaged them to build this Alden-design boat, the first they’d ever built. The man in charge of the project was an Italian who’d gone to Oxford. He was very glad to meet Mr. Norton. “I spent March up the mast, because they’d never rigged a boat,” he said. From there he flew back to England, to receive his master’s from Oxford, and thence back to America. Mr. Norton said he had “always been interested in the spiritual dimension of human experience” and his experience in India reinforced his feeling that “there was a spiritual dimension not being expressed . . . in the American way of life. “So I decided at that point . . . to explore the ministry, so I went to Episcopal theological school for a year,” he said. And there he met the woman who would become his wife, Sonya McDonald Spencer. She was secretary to the dean. Their first outing together — one would not really call it a date — was when she was invited by another male student to join a group of about 10 men singing madrigals. So she lost a job, but gained a husband. On Sept. 9 this year, they will have been married 50 years. He got a job teaching at the College of Wooster in Ohio in the department of religion. He was Episcopalian, the college was Presbyterian, but such delineations of faith were never of great relevance to him. Nor were what he called the “checklists” of dogma, “the transfiguration, the virgin birth, et cetera. “Religious life is not based on what you believe. Your faith is based upon the way you live your life,” he said. Mr. Norton lived his life as a teacher for 10 years at Wooster, then a couple more at other colleges, before he felt the tug of Vineyard. Coincidentally, in 1972, Massachusetts passed a law allowing farms to be taxed at their agricultural value, rather than at their potential development value. There had been some family land — nearly 60 acres, at the Head of Lagoon Pond — which had lain fallow since 1903, when his great-great uncle died. It passed to his father, then to him. “We decided to re-activate this farm. Abutting on the Lagoon, its development value was out of sight,” he said. Did he ever think how rich he might have become by selling it? “But not rich in any sense that would be important to me,” he said. Anyway, here he has been ever since. Which brings us back to the real point of this story: Not long after his return here, Mr. Norton was prevailed upon to compile a history of Vineyard Haven by “an amazing, wonderful” woman named Dorris Hough. She had grown up in town in a house on William street, and having spent her working life elsewhere, retired here. “And she developed the idea that when she died, no one was going to pay any attention to the significance of the history of the town,” said Mr. Norton. 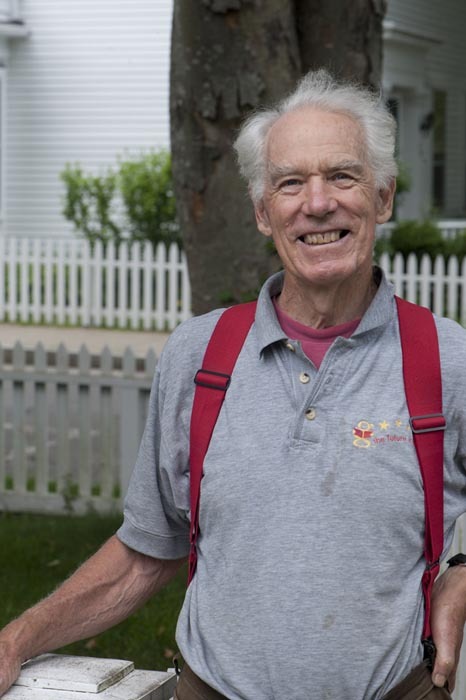 “So she marched on town hall, in her nineties, and had created the Tisbury Historic Commission, then set out, as the first project of the commission, to create a historic district in the town. “A historic district, it’s a form of zoning, so it requires a two-thirds vote of town meeting, and requires also the filling out of a number of forms for the Massachusetts Historic District Commission, establishing the significance of each of the structures. 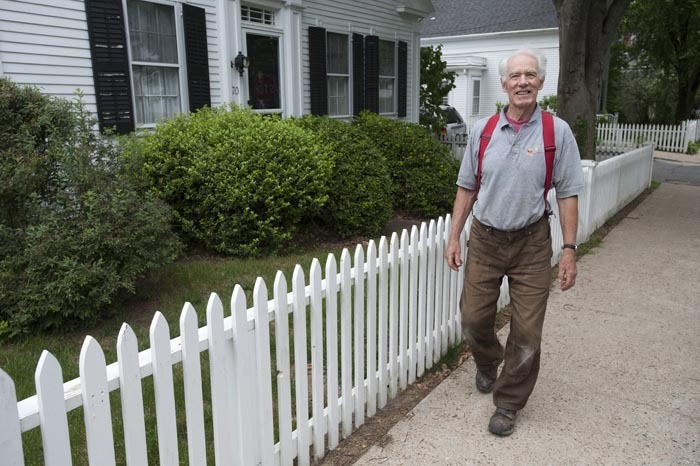 So he did it, and became in the process an expert on the history of the Island in general and historic Vineyard Haven in particular, much in demand for walking tours of the historic homes of town. So much in demand, in fact, that he eventually wrote a book about it, so he wouldn’t have to do the tours anymore. But he has been prevailed on to do another, for the Martha’s Vineyard Museum, this Saturday. There will be a lecture by Mr. Norton at the Katharine Cornell Theatre, starting at 11 a.m., a patron’s tour from noon to 4 p.m., and a general tour from 1 to 4 p.m. The museum Web site advertises the tour as a chance to get a better look at the exquisite architecture of William street, but it is about much more than that. It’s about a place which has had an extraordinarily adventurous and cosmopolitan history over hundreds of years. A bit like Mr. Norton himself. His own life, on the sea and in faraway places and on the farm, he suggests, are really just part of a continuum which goes back to 1659. “I would sit in my room in Madras and read a Gazette account a hundred years ago of Captain Norton sailing a whale ship in the Indian Ocean, and think yep, of course,” he said.